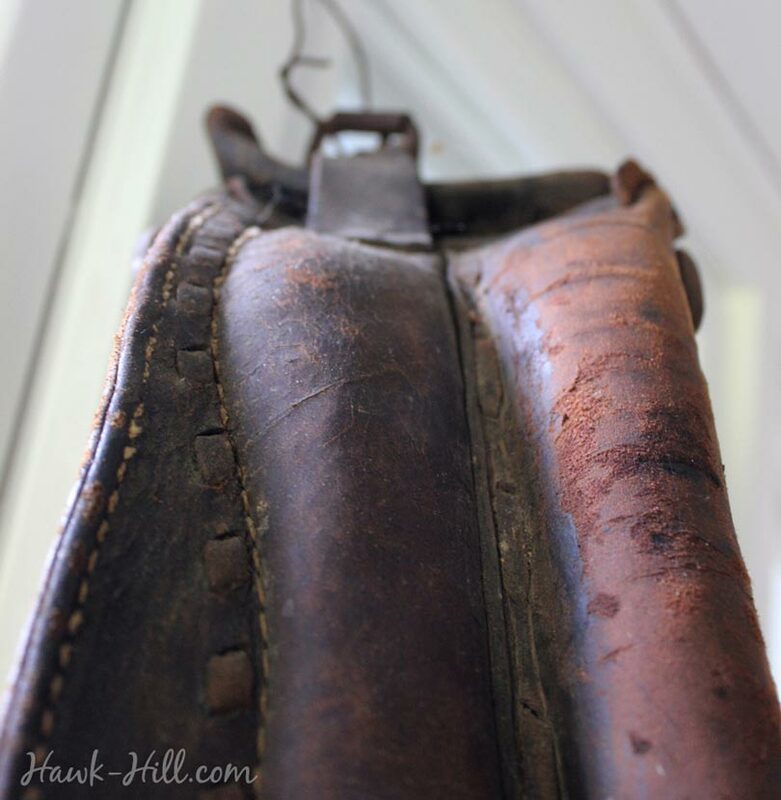 Start by taking a few moments to care for the leather. This step will help keep your wreath looking great much longer- especially if you plan to use outdoors.You can skip A and B if your collar is clean, but do not skip C! A. Go ahead and WASH the harness thoroughly with water and, yes, even soap. Use saddle soap (available at any farm store) if you have it, but any mild soap (Castile, Ivory, unscented Dr Bronners, etc) will work. 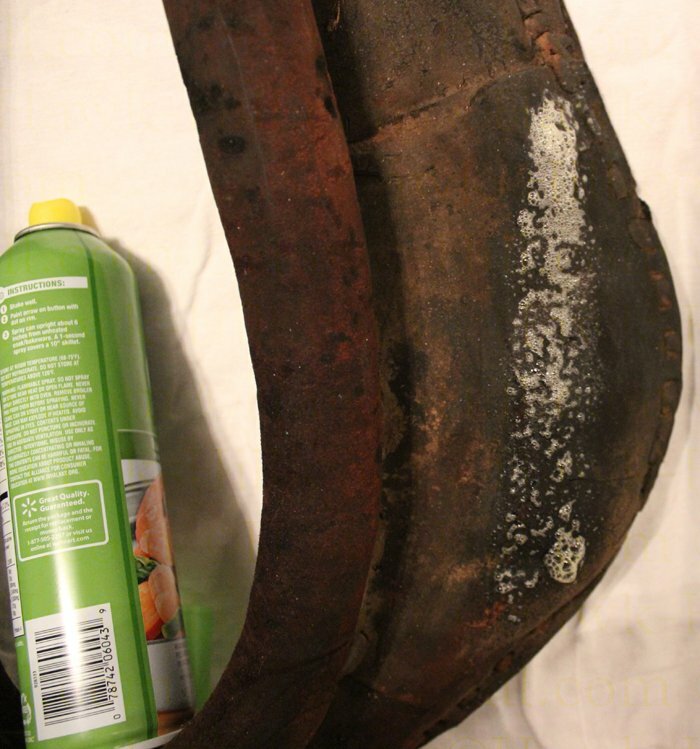 If you found your collar in a similar condition to mine, you may need to scrub to remove layers of dirt and reveal the patina of the aged leather underneath. Be very gentle if the leather of your harness collar is brittle. 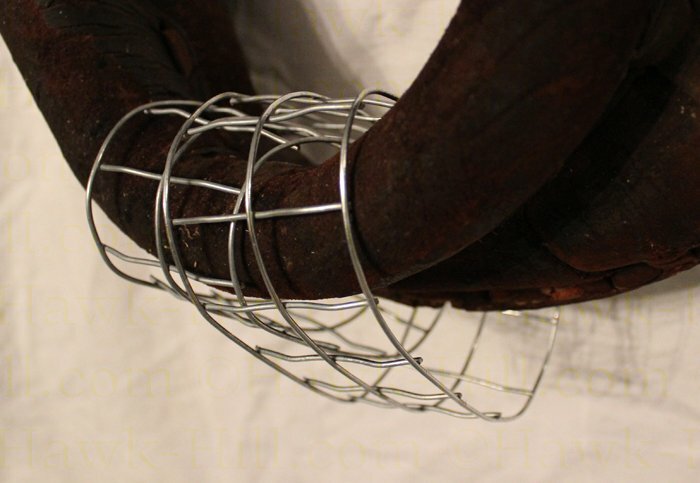 Do not soak or submerge– these harness collars were often stuffed and padded with straw or newspaper and saturating the stuffing is an easy way to cause the collar to rot from the inside out. C. When fully, 100% dry, you’ll need to oil the leather. Leather has natural oils that dry with age or are removed by soap and water and need to be replaced. You can buy special leather conditioners, but for a decorative piece like this its much faster and easier to use cooking spray. I use olive oil but any shelf stable oil would work. Start by conditioning your collar- spray the collar with cooking spray and allow it to soak in completely. 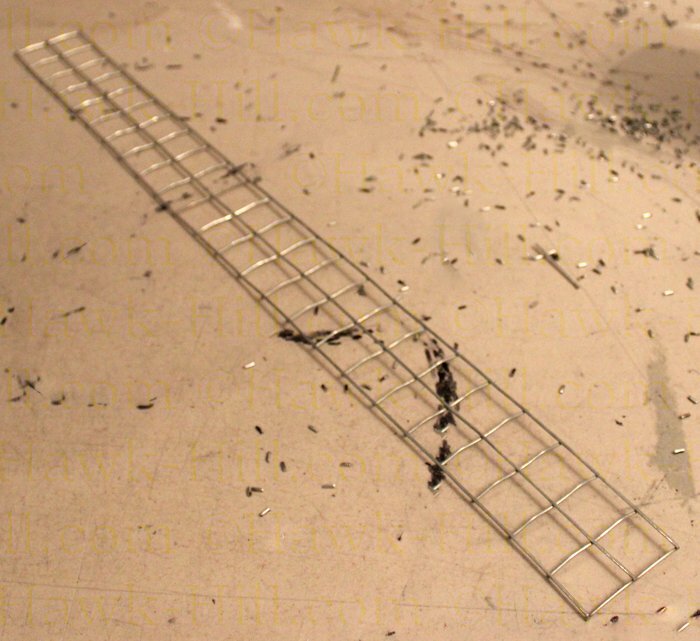 We’ll begin by creating a base that we can easily attach wire to to anchor decorative elements. I cut a narrow strip off a roll of hardware cloth and wrapped that around the bottom of the collar, but you can use whatever material you might have handy that will accomplish the same purpose. 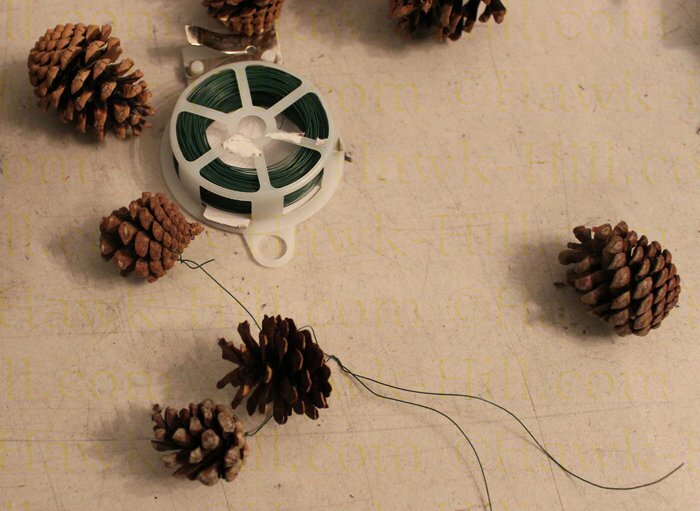 The next step is to begin attaching greenery. 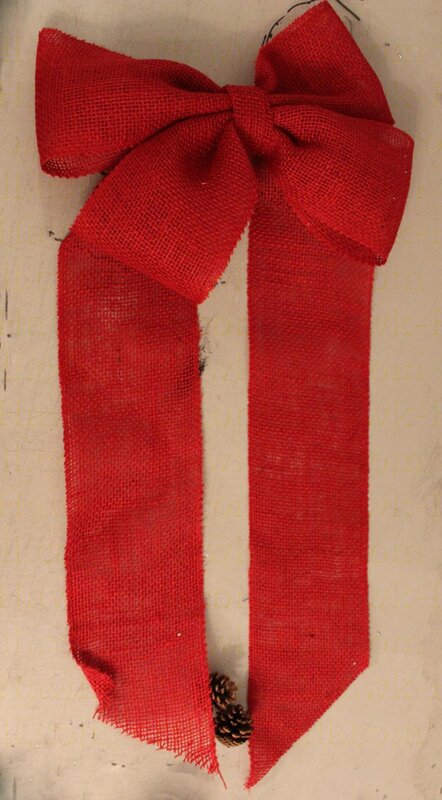 Take 2, roughly 24 inch long pieces of garland and attach them side by side to the wire base you just added to the collar. 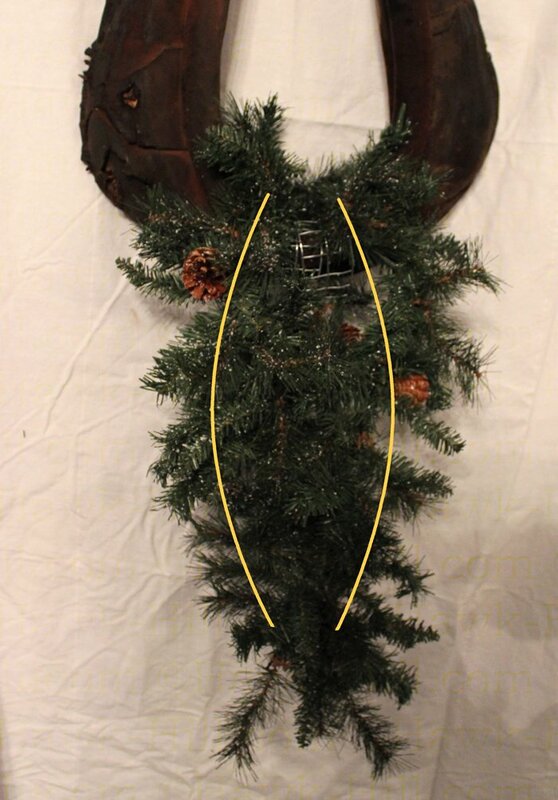 Leave a space between where you anchor these pieces, as a top piece and decorations will fill this space in later, and it’s important that the top section appear wide, to balance the wreath. You can use the built-in wiring or a zip tie for extra security. Step 4: bring the ends together. Make this bow-shape permanent by intertwining individual pieces of greenery together at the bottom. Fluff your greenery. It is okay at this point for it to appear thin in the center, but the basic outline should balance out the top of the collar. Step 5: take a new piece of greenery, about 12″ shorter than the first pieces and attach to the center of the bottom of the collar, overlaying the sparse portion of the lower layer. Personally, I use a more expensive, higher grade of greenery for this section- because it’s so much more visible. Somehow I managed to miss getting a photo of this step, but you can see the 2nd layer on the photo below, under the pinecones. Step 6. 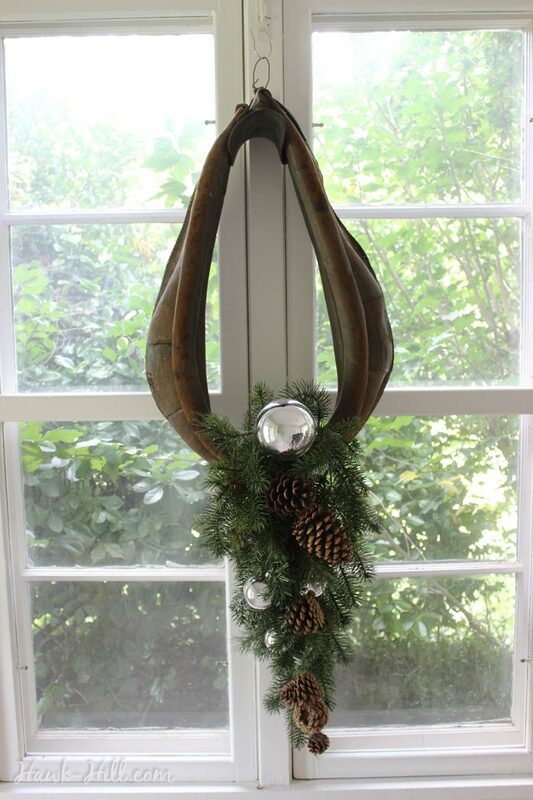 You’ll want to add some decorations to bring your wreath to life. 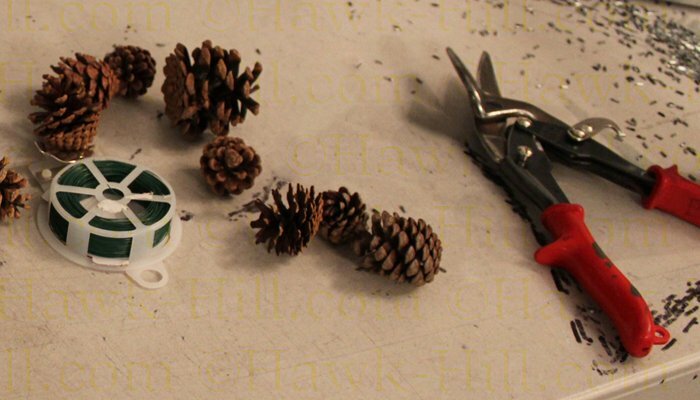 I used silver ornaments on my first wreath and pinecones on my second. 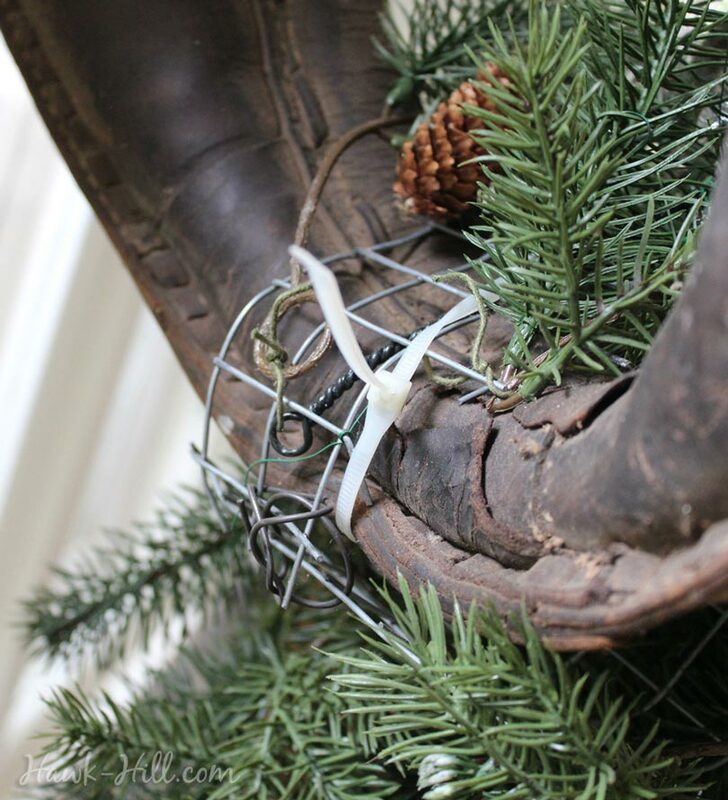 You can wire in each object separately or wire the decorations together into a sort of garland and then anchor the garland to the wreath. 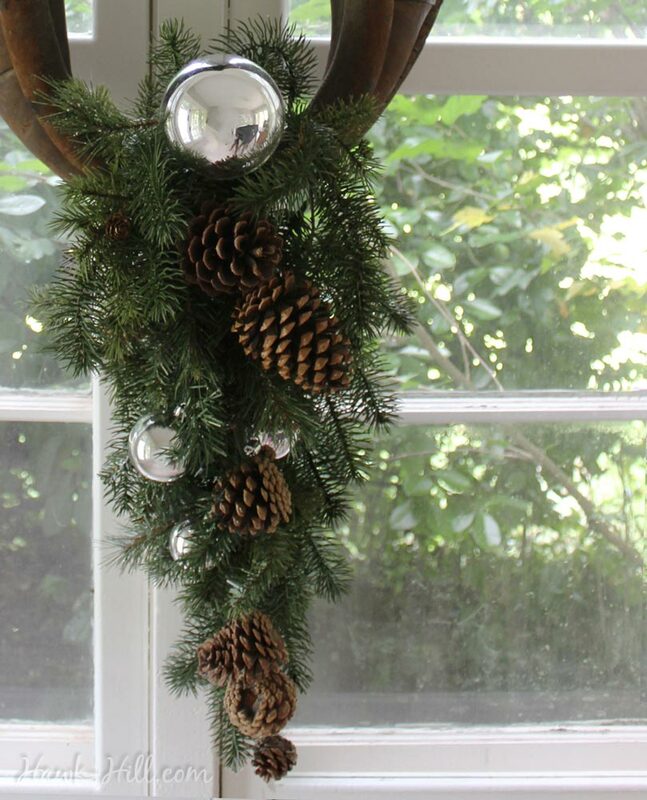 Then anchored my pine cone garland to the top, and nestled my pinecones into the greenery so they’d look natural. Be sure and intertwine the floral wire and the sprigs of greenery, so outdoor display in the wind won’t ruin your careful arrangement. 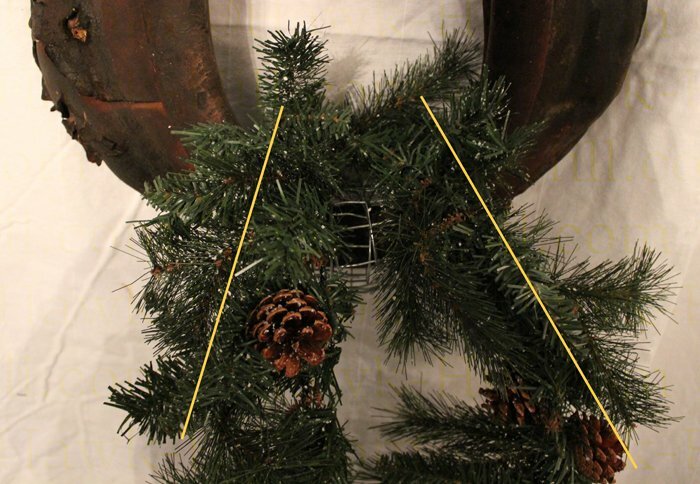 OPTIONAL Step 7: You may want to add a bow to finish your wreath. I though red burlap complimented the aged leather well. And after three tries I came up with a decent, though a bit larger than I’d planned, bow. I’ll skip the bow tutorial since there are literally thousands online and I’m not particularly skilled at that art. 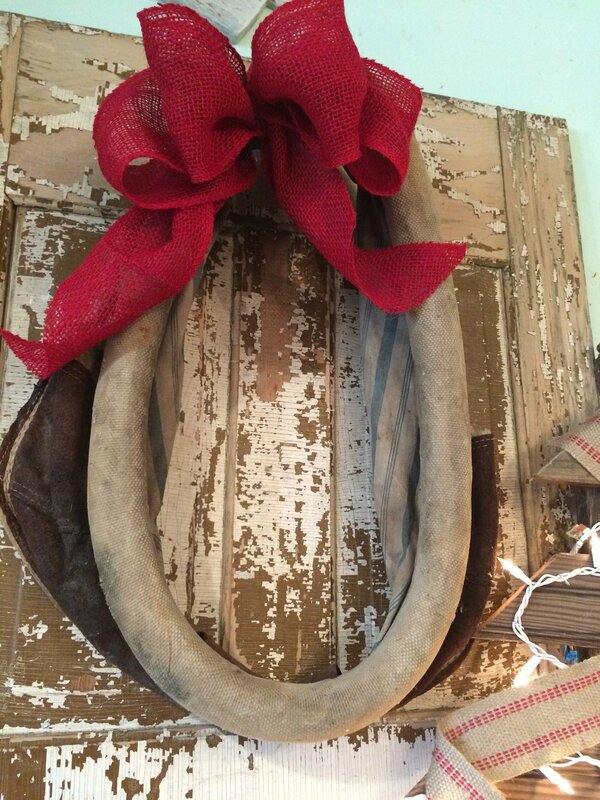 The final result: a horse collar wreath for display for many years to come! 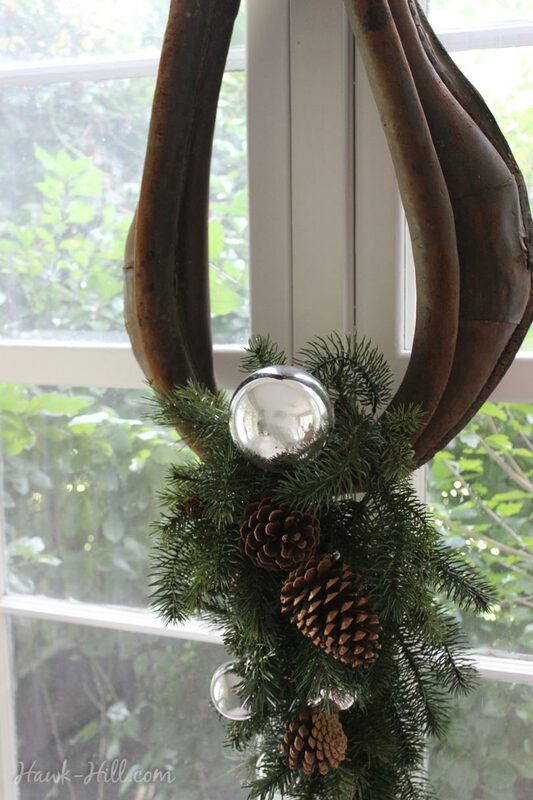 Thank You for sharing with your readers another absolutely outstanding equine wreath idea! I love your site so much and refer many here! Thank You Again~!!! Thanks so much, Susan! I’m just so glad to have someone appreciate my equestrian-centered style! 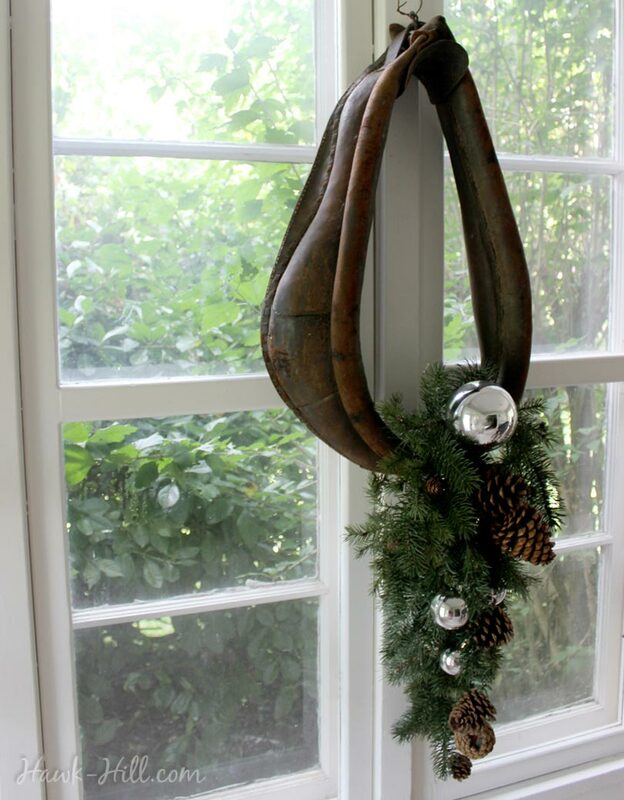 I SO LOVE this use of old horse collars!! 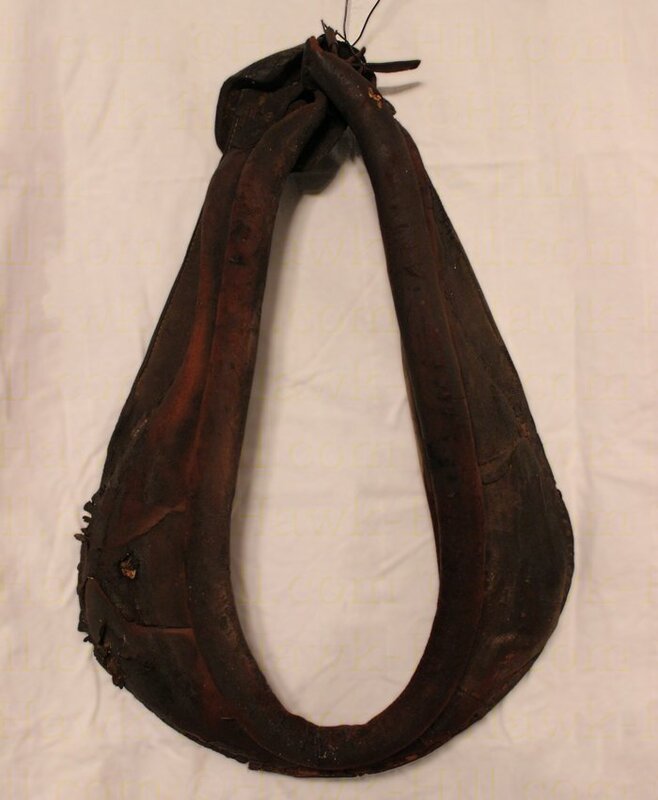 I have my Grandfather’s saddle, horse collar, headstalls with blinders….and never knew how to display them! 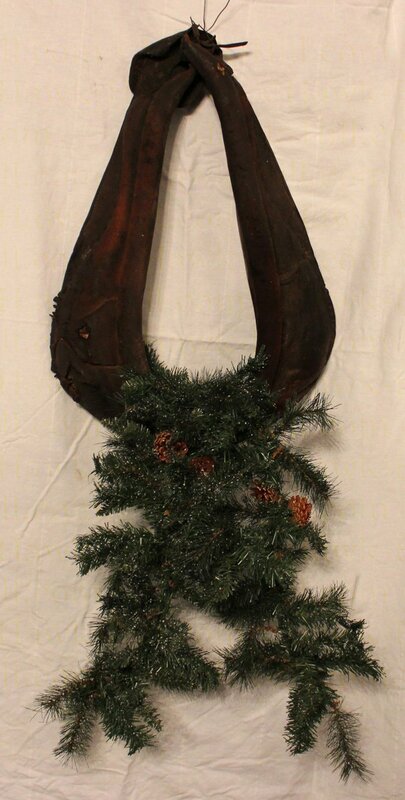 I have his saddle in my living room….also the horse collar which is in excellent shape….SO, thanks to you I use it as seasonal decoration and focal point! NOW, for my question…HOW do we hang it??? Mine is VERY VERY HEAVY ?? I have plaster walls….my front door is metal…so that is out….? Any suggestions? 🙂 <3 <3 <3 Any ideas for the headstalls?? Those will need cleaning and conditioning….one has a snaffle bit attached ! !